We have the opportunity to offer you the chance for every participant sew on the new top the line Husqvarna Viking 980Q sewing machine for the entire class. If you have been thinking about purchasing a machine you need to check this one out! There is 12.2-inches of throat space and 5.5-inches working area height. Very special pricing for attendees. Class starts at 9:30AM and runs until 4:00PM, class fee is $40 to reserve your space. Your day will include two projects and lunch, instruction by a national educator, and a coupon for $50 off a machine or anything else in the store that day. Teaching the class is Nancy Bronstein who is an Event Specialist for SVP Worldwide which is the parent company for Singer, Viking and Pfaff sewing machines. 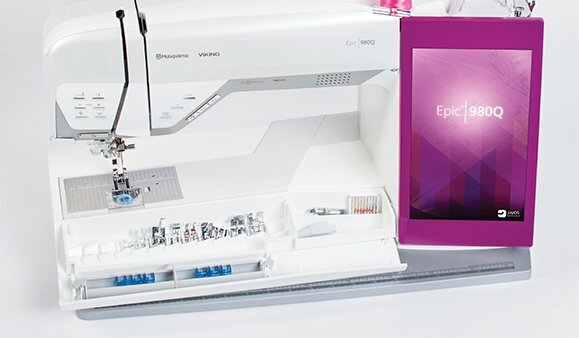 Nancy travels the country for SVP teaching sewing, machine embroidery and how to use the Premier +2 embroidery design software. Nancy has been sewing since grade school when her mother taught her to first make doll clothes, then her own clothing. She loves to teach the latest techniques in garment construction, bag making, home dec, quilting and machine embroidery. Her classes are designed to challenge but not overwhelm her students. She loves to help people bring their creative vision into reality. Her goal is for everyone to have a good time and that all students walk out with a new skill set.